Here is a behind the scenes look into our "Epic #308" we shot a little over a week ago that premiered on this blog. We have also gone ahead and put up an entire new section of time lapse gear for you on the popular gear section – and that’s live now. Redwoods – Behind The Scenes from Vincent Laforet on Vimeo. As you’ll see we used a variety of gear – notably Kessler Crane’s Shuttle Pod System with their Electra motors and Oracle Controllers. This allows us to motorize the cameras on the dolly track – both for time lapse photography (with HDSLRs still cameras and/or the Epic) as well as to shoot live action (video – i.e. motion control.) It’s important to note that you can do this at an incredibly reasonable price relative to other systems out there – especially high end systems that quickly go into the $30K all the way up to the stratosphere for high end systems. Next week I’ll go into a bit more detail about each piece of gear and what I recommend you use for each situation – and I’ll pay attention to your budgets and needs. You should note that we used both the Cineslider and the 4 foot track sections with and without motors for live video and got incredibly good results with our fluid head (in this case the O’Connor 1030 HD) That being said I found it incredibly useful to have the option of using the motorized system as well of course. 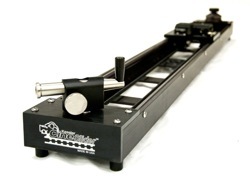 You have very fine control of how fast or slow you want your slider/dolly (or tilt/pan/rotate) move to be. In fact you can add dampening (in effect ease in and ease out) to get moves that only an experienced dolly grip could do – but that I couldn’t if my life depended on it. I always seem to screw up long moves towards the end – all too often because I have to take a step or two in the middle of the move (or to be honest, I usually seem to trip on something or worse one of the tripod legs ..) or I am focusing so much about getting the motion just right AND panning perfectly at the same time. It’s not easy – especially if you’re under pressure or if you’re watching that once in a lifetime moment. In terms of advice for live action (video) moves – the best thing I can share is to remember that every slider/dolly shot should have a perfect frame at the beginning AND at the end of each move. The truly masterful dolly shots happen when you can keep the frame interesting throughout the entire move. There should be no dead or boring spot during the entirety of the move. Also – you seldom need as long of a slider as you might think… You’d be surprised at how effective a 3 foot slider move FORWARD toward your subject is – that’s what we did for the tree shot at the start of "Epic 308." We did that on a simple Cineslider with one motor a still head with a 17mm Tilt shift lens. If you study that shot, you will see how well you can appreciate the forward motion on such a small dolly move. This is one of the keys of any slider or dolly shot: to have your audience appreciate depth as the camera moves through an environment – something you can’t do with pan and scan (zooming in post) or on a stationary tripod. The effectiveness of your slider/dolly move has everything to do with two main factors: First a wide angle lens will always accentuate a forward or backward move (a push or a pull respectively) more than a standard or telephoto lens. Second – you MUST have strong foreground subject (in this case the trees) middle ground subject (the fence) and background subjects (the distant tree atop the hill.) That will truly allow people to appreciate the full breadth of the move and feel the 3-dimensionality of the environment. I’ll take this kind of "3D feel" over "3D" any day! The moving stars in that shot are the cherry on top of course. The light you see coming at the end of the shot to the left is the moon rising by the way… I knew that was going to happen with the use of my Sunseeker app and was rewarded for that extra research if you will. Keep in mind that no matter how perfectly thought out your time lapse is, what makes it truly "magical" is something unexpected… to see more of that check out this old time lapse also done on a Cineslider in Naples, Italy – you’ll see what I mean by the "unexpected" making your time lapses rise to the top. Or you can pretty much check out any of Tom Lowe’s work at Timescapes.org. The guy is awesome! Rainbow Time Lapse – Napoli from Vincent Laforet on Vimeo. As far as more time lapse tips – that will come in the next Behind the Scenes post. There’s a lot to talk about there as well – and I’ll go more into why I think it’s very hard to remain "competitive" with time lapses that don’t have the camera moving these days – and why motorized sliders have become essential. It’s mostly a function of how ubiquitous time lapse photography has become and how acccessible it is. That being said – there are many exceptions out there of a simple time lapse on a tripod of course! I want to thank Kessler Crane for funding this trip and the behind the scenes looks you’re getting here. You can help support them back by visiting them of course! I also shot many of my still images with the Hasselblad H4D 40 Megapixel camera – and found that the camera’s image quality was pretty stunning. As cameras like the Epic start to push into still territory – I find that many photographers are going to rely more and more on very high resolution backs to produce a distinct product that stands out from the rest. I’ve been a huge fan of the Canon 5D MKII and Canon 1Ds MKIII for years – but the resolution and depth you can get from a 40 Megapixel back is hard to ignore if you are in the business of making fine art prints. When you shoot HDR images – the results are stunning. I’ve had a tremendous pleasure making large 60 X 40 prints off of these images and been very very impressed with the results. While many photographers will find 21 MP to be more than enough for their needs – I see portrait and fine art photographers gravitating to these larger backs over the next few year – again to distinguish themselves from the massesl. Let’s face it: it’s not uncommon to have a high school student or your hobbyist friend sporting a 12-21 MP camera these days is it? That being said and as well all know, it’s the photographer – not the camera – that makes the image. See you all early next week with more. Thanks as usual for sharing. I saw in the video above that you showed a sample of the HDR image form the Hasselblad H4D 40 , do have a still sample that you can share on your site for closer inspection? Thanks again for the wealth of knowledge that your site provides us all with. Cheers. Vincent, Just want to say thanks for what you do. Beautiful stuff. I’m a writer/director…. now 5D operator of sorts. My first feature was released in the theaters last year. “Lunatics, Lovers & Poets”. (super 16mm) Won a bunch of awards, Didn’t do great at the box office but it played next to “Hot Tub Time Machine”!!! Anyway I escaped from Hollywood last year, and settled in Fl. to where I now I have to feed my babies so I picked up a 5D after a NIkon D90 and I’m learning this whole DSLR thing. So following you and Chase has been invaluable to me to bring me up to speed so to speak, and bring in a little income while waiting for the next feature to fund. And waiting… and waiting…Not sure this is the correct venue for this post so I apologize to others who have to read it, but I need to say I appreciate you. john – congrats! And I very much appreciate the time you took to write! means a lot! Fantastic ideas, a usual a lot will go on my reminder list. Really cool equipment and great results! Must have been a lot of fun! One question regarding the Napoli video: I am used to the fact that music rights for popular songs are hard to get and very expensive. Since you are using Radiohead: Are you just hoping to be lucky? A deal with Radiohead? A special program from Apple? Excited to see more of what you shot! 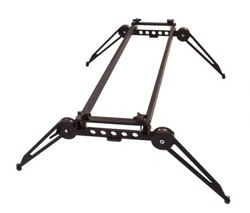 Just ordered the PB Pocket dolly and the Basic controller setup. Dolly comes in tomorrow. Can’t wait to get moving! You’ll have fun – I’m sure! Love it! Even your behind the scenes video has a great production value! Love your approach to timelaps to think about it before you start to shoot. You should come down to New Zealand and do some glaciers and fjords and maybe you catch an elf as well. 5ft CineSlider and Revolution head are already waiting down here. You invite me.. I come! Always wanted to come to NZ! never been!! !